Well it is that time again. Quiltmaker has put out another issue in their 100 Blocks series - Volume 6. These magazines are so fun! Can you guess which is mine? Well, here is a hint. 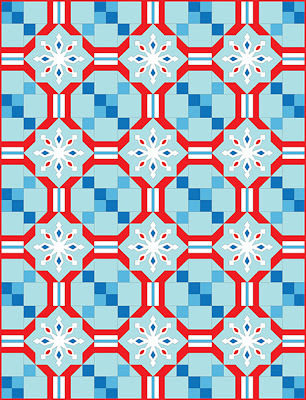 I've had a thing for aqua and blue Christmas designs lately. 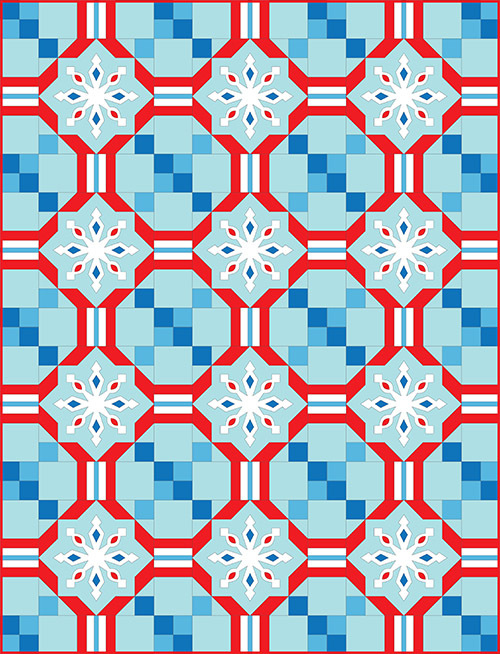 Yes, mine is the white-on-aqua snowflake in the second row. It is on page 42 and is called "Winter's Jewel." I enjoyed making this. 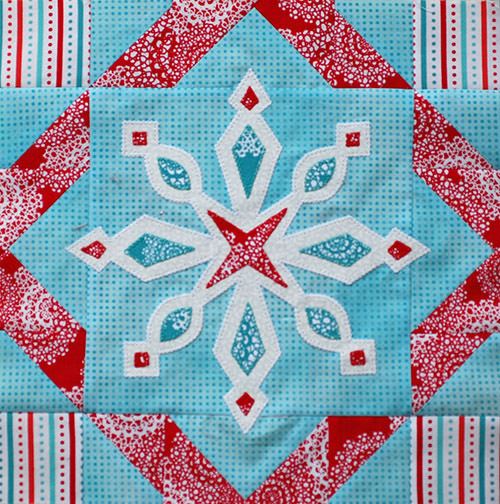 The applique and piecing are really simple but, because of the color choices, they look bold. I used some fabrics from Laurie Wisbrun's Brrr collection and also some neutrals by Patrick Lose, both of which are manufactured by Robert Kaufman. Winter's Jewel can be arranged in many ways. 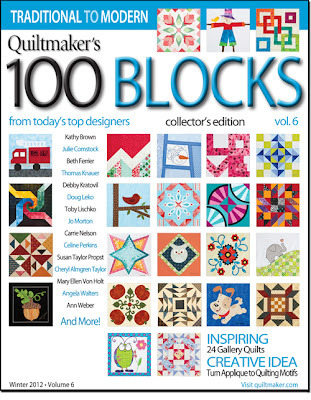 Be sure to check out all the other blocks and enter to win more giveaways on Quiltmaker's blog! Gorgeous block! I bet you are not a gardener because all your time is spent creating beauty with your designs instead of with plants! Total guess...and thanks for the chance! Hmmm...I totally believe #2, because that's the kind of thing I would do. Since your patterns often have a garden element, I'm going to guess #3 is true. So, fingers crossed, I'll say #1 is the lie. #3 is my guess for the lie. Love your block - thanks for the chance to win. OK, I'm thinking #1 is it, but I could also think it would be #2--#3 appears to be something you would do (got this from your website). I think that #1 is probably the lie...and the block is amazing! Total Guess - #1 is a lie. 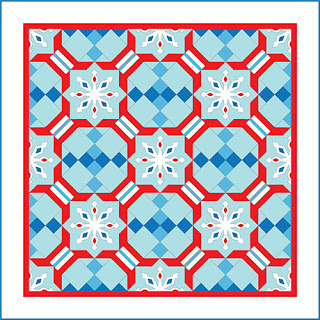 Hi Amanda, this is Diane from Quiltmaker. Nice post today--I like the different settings you showed. Fun little block, too! I'm going to guess that #3 is the lie--since it is the most believable given all your beautiful flowery quilt designs! Love your block! Thanks for the chance to win! I am thinking you are not an avid gardner:) I am not sure which drew me to your block...the colors or design but I certainly love it! I'm thinking that you are NOT an avid gardener - You're too busy making gorgeous quilts for us to drool over! I want to say the 3rd is a a lie, re 'avid gardener', because I love the idea that you worked in a wood shop. And I like the Snowflake Runner -- very nice! I'll guess......2 (even though it sounds believeable and could totally see myself doing that)... I think creative people like to create, whether it's wood, flowers, food or cloth....fingers crossed. 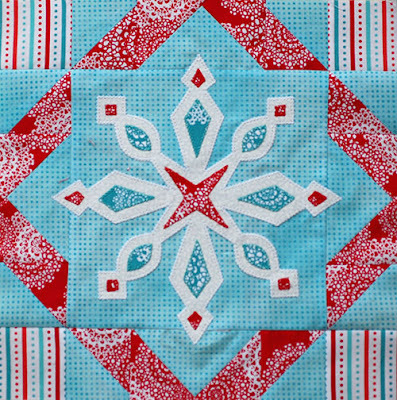 Love your snowflake! Love your block - table runner! As someone who is creative all three could be true...sorry I haven't found your blog before now, so I would know the true statements...but I love your block,especially as the table runner! Very nice block....ok I am going for #2 as the lie! I tried to read your profile and "about me" section, but my computer wouldnt let me. dont understand these things. So I just have to guess #2 is the lie. I have worked in a woodshop and I love to garden myself...would love to win one of your patterns! What a clever way to pick a winner! I will guess......you did not work in a wood shop. Total guess............#2 is the lie. I'd say #3 is the lie. 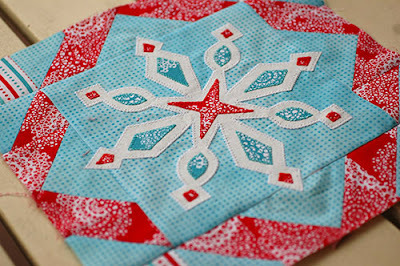 Love the block...I miss snow here in South Texas, so tend to get it by stitching it!